Ever wonder how foundations and pension funds manage their assets? 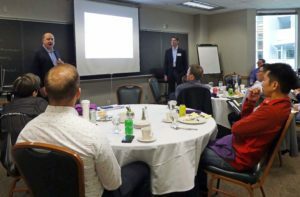 On October 26th, Kurt Hoddinott, CFA and Shawn Wischmeier, CFA shared their experiences as plan sponsors, with a group of professionals. Over the course of lunch, the speakers explored their backgrounds, day-to-day tasks, and some of the challenges they face in the industry. 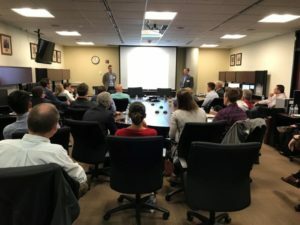 Kurt Hoddinott, CFA, Senior Manager of Investments at General Mills, and Shawn Wischmeier, CFA, Chief Investment Officer at the Margaret A. Cargill (MAC) Philanthropies, traveled two separate paths to arrive at their current positions. Kurt has spent most of his career at General Mills, holding positions in various parts of the company until landing in their investments division. Shawn began his career as an engineer before switching gears and working for various state pension funds before arriving at the MAC Philanthropies. While pensions and charitable donations may not seem similar on the surface, both speakers agree that there are a lot of similarities. Shawn manages the various payout obligations the individual foundations have pledged to donate to, all while maintaining the foundations’ combined $7.5B assets on an inflation adjusted basis. Kurt matches the payout obligations to the various employees who have pensions with General Mills, and ensures the company has high-quality fund offerings for the company’s 401(k) and medical plans. The goal is to ensure General Mills’ $6B pension fund can meet its obligations to the employees in a cost-effective manner. On the other hand, both speakers have tasks unique to their position due to differences between a foundation and retirement plan manager. MAC Philanthropies has a small amount of its assets set aside to implement unique investment strategies, and part of the day is spent implementing and monitoring these investment strategies. General Mills has a 401(k) and medical benefits plan that places the investment risk on the individual employees. In his role, Kurt ensures that the fund offerings balance between choice and simplicity that employees can understand. Our speakers were kind enough to share some of the challenges plan sponsors face and reminded the audience that life is never sunshine and roses. Both speakers agreed that volatility can be a major challenge for them. They have obligations that must be met at a steady rate while market swings can result in exiting investments at inopportune times. Each speaker also had a unique challenge facing them. As General Mills transitions to defined contribution plans, Kurt explained that it was a challenge to encourage employees to contribute to their retirement plans. It can be a struggle to educate the employees on how important it is to save money now for retirement rather than waiting until it’s too late. To help employees make better decisions for the future, General Mills has provided an online tool to help employees determine how much they need to save to comfortably retire at a desired income level. They also have 3rd party financial advisors that employees can consult on a more personalized level for a fee. Shawn’s challenge is a little different. His challenge is that MAC Philanthropies is closed from additional funding. There are no additional payments to help cover losses in a down year. This adds an extra challenge to make sure the plan is meeting the required returns to support the foundations’ goals in perpetuity. With a challenge like that, it’s clear to see why volatility would be a major challenge. A special thanks to Kurt, Shawn, and all the members of the CFA Society of Minnesota for making events like this one possible. Now it’s time to get out there and invest! Cheers! Be sure to check out upcoming Day in the Life events on our events calendar.